Maybe it should be “NOTW”. Anyway. I got Crimson Uprising a few weeks ago and finally got around to wearing it last week. And now I am finally posting a review and photo of it. I am so not on the ball. Crimson Uprising is a bee-yoo-tee-full red shimmer. Just when I think I have every red shimmer under the sun, something like this gets released! It’s a cool-toned red, with heavy pinked-red shimmer. In bright light (like in the indoor photo) it is very shimmery, almost brash! In dimmer light, it can look quite dark and serious, with subtle shimmer. 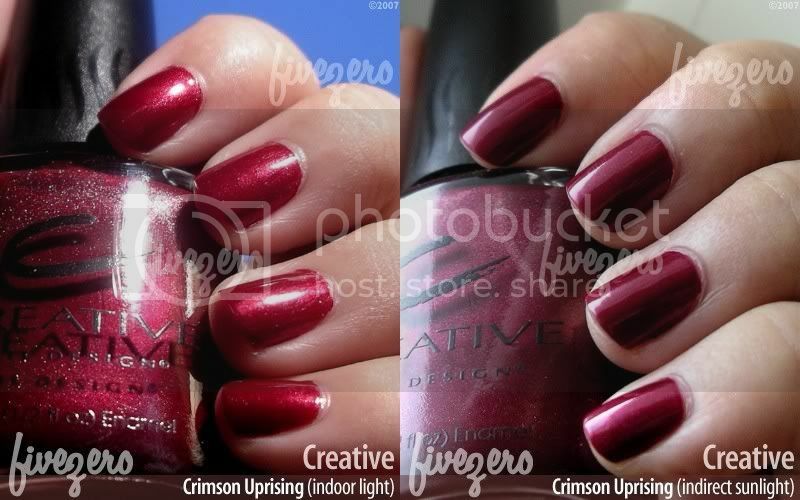 Creative’s colours often impress me due to their lush, rich pigmentation; Crimson Uprising is no exception. And, for a cool-toned shade, I think it works really well on me. 🙂Rating: 4.5/5.